If you’ve got a few stray ends of stale baguette or other crusty bread, don’t toss them. Instead grind into crumbs and toast with butter and olive oil, garlic, orange zest and herbs. 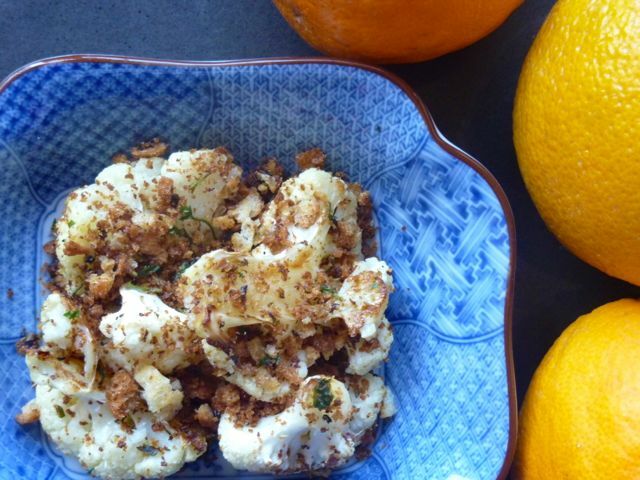 You’ll have a quick and delicious topping, known in Italy as pangrattato, that dresses up roasted vegetables, like cauliflower, with crunchy flavor. For an easy main dish, toss the entire lot with your favorite cooked pasta such as fusilli or farfalle. This version of pangrattato is inspired by Nigel Slater. 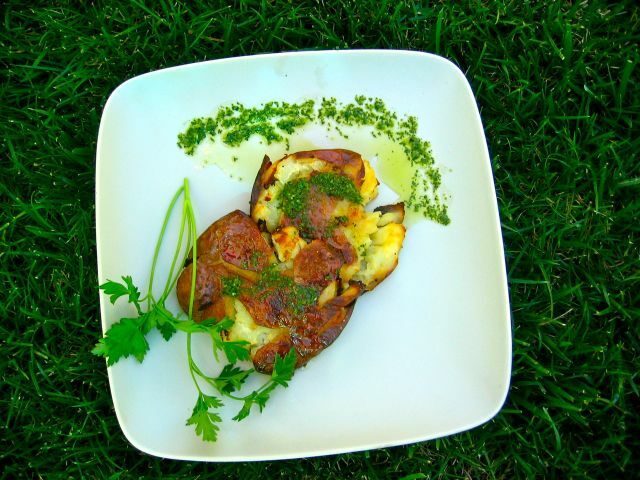 Adapted for a smaller sized potato, from chef Alejandro Morales’ recipe in Bon Appetit, if you have nothing but large sized potatoes, just cut them in half. These delicious pancakes are a great combination of flavors and textures. 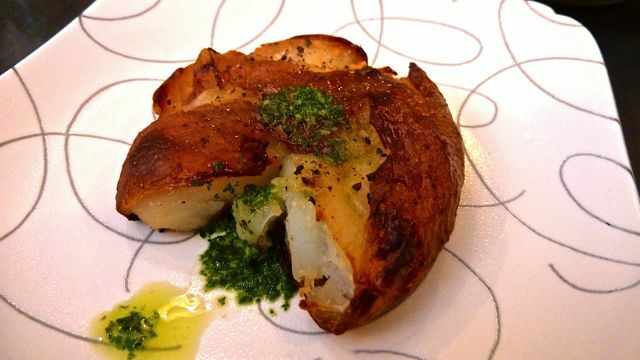 The skin of the potato has a nice, roasted and crunchy texture, and the potato itself is sweet and so tasty that you will want to lick the plate clean. 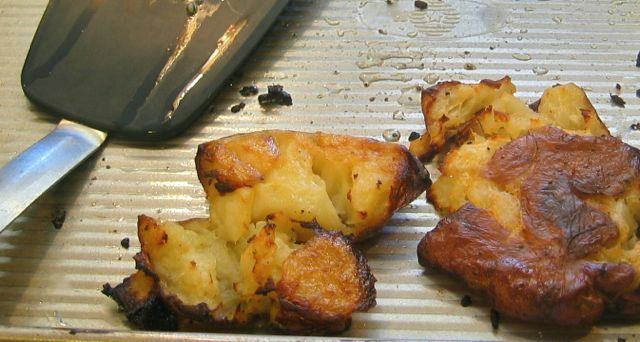 These potatoes are very simple to cook. They are very good by themselves, but they have an even more wonderful taste when accompanied by parsley oil. You may want to use a knife when you eat this delicious meal to help cut through the crispy skin. This recipe was tested and photographed by Emma P, Katelyn E, Ariana C and Ashley J—7th graders at The Girls’ Middle School. 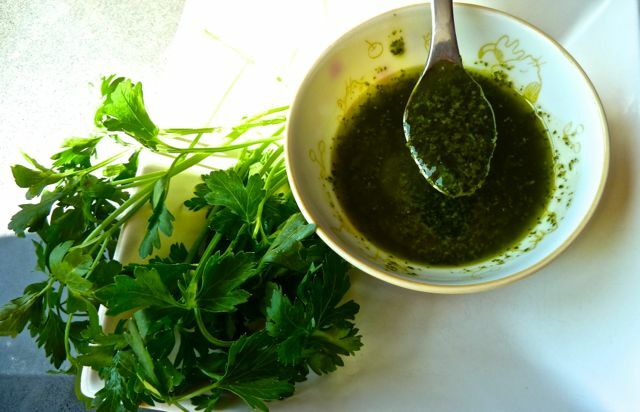 This lemon-parsley oil is easy to make, flavorful, and adds a certain “zip” to any meal. 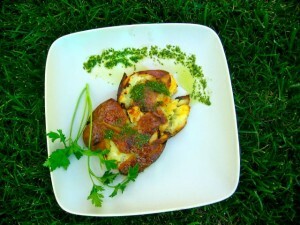 It would be terrific with Smashed Roasted Potatoes (pictured above). We’ve reduced the garlic and lemon juice slightly from the original version. 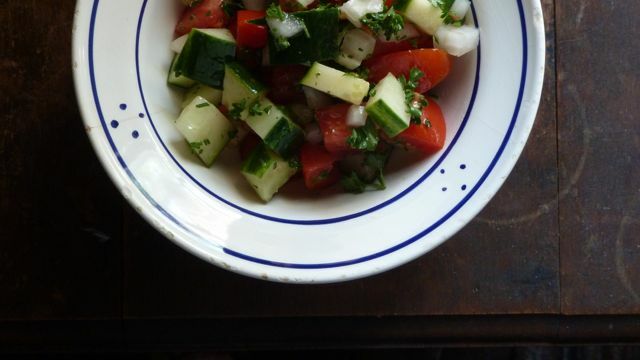 This recipe was adapted from Yotam Ottolenghi’s vegetarian cookbook, Plenty, by Tess M and Caroline W—6th graders at The Girls’ Middle School.